I am 52 and I just started learning the sax tenor. I had my first lesson last week. My previous music experience amounts to 1 year of studying the piano 20 years ago. As expected I am finding the embouchure very hard so much so that I am trying different ways like with the lower lip sticking out rather the folding over the teeth. Do you know exercises to strengthen the muscles around the lips? By the way my teacher is clarinet player who also owns an alto sax. Is there a difference between the embouchure for the clarinet and the one for the sax? Good to hear from you. That’s great you started learning saxophone, you should have a lot of fun with it. I have played just a bit of piano myself, but mostly I do saxophone. How did your first lesson go? For embouchure….. you might be okay sticking the bottom lip out a bit more, but don’t put your teeth on the reed at all. I started playing clarinet before saxophone myself- the difference is that you need to be a bit tighter on clarinet and it requires more control. Therefore it’s better to go from playing clarinet over to saxophone rather than the opposite. If you’re not planning on playing clarinet, I wouldn’t worry about that though. You’ll develop the muscles naturally as you play, but one thing that really helps is long tones. What I do is take a breath, start on low E and play it as quietly as I can then move up to F. You use one breath for two notes and go up chromatically. I go up one octave and then come back down. Does that description make sense? I was thinking about making a video of myself doing it…. so I could do that this week sometime. I’d really avoid sticking out the lower lip too much. In fact, one shouldn’t really talk about “strengthening” the embouchure. It has nothing to do with “strength”. “Playing the saxophone should be just as relaxed as talking.” – that is what Joe Allard had relayed to me with studying with at the Manhattan School of Music. The lower lip is not designed to take a lot of pressure, and is surely not there to support the pressure applied to the reed. You need the support of your lower teeth through the lip in order to produce a decent sound. That requires NO pressure from the lower lip at all. To form your embouchure, just think of saying the letter “A” or say “Hey!”. This tauts your lower lip against your lower teeth, raises your tongue in your mouth (tongue position – often ignored when it come to intonation) and when you blow, this prevents the cheeks being puffed and forms a steady, focus pathway for the air to ride over the tongue and directly out between the teeth. Above all things, avoid lowering your jaw to play the low notes, and avoid pinching to play high notes. This will only hinder your performance, not help it. Yep, long tones are very important. They’re crucial to tone development. That’s a pretty good description of embouchure too, how you shouldn’t worry about it as you’re playing and you just push the air through the horn. Well this is encouraging, i never really learned properly but played and faked in the early 80s with a handful of pop bands. At 52 myself, I am going to relearn the right way, i haven’t played in close to 20 years and I’m excited. The resources available now in comparison to the 80s are amazing. Great site here as a matter of example! Thanks Otis, glad it’s helping you! I’m off on a long trip and bringing my sax is not possible. Other than bringing a mouthpiece (and annoying everyone with my duck calls), is there any exercises I can do to help me keep my embouchure muscles in shape? There must be some product or devise out there that can help. I actually saw a ‘silencer’ for saxophone – http://www.jazzlab.com/ a couple of weeks ago. Haven’t tried it out yet myself, but it seemed interesting (and less annoying). You can also buzz your lips, like a trumpet player does. An option that would be more musical would be the Xaphoon which I have heard some good things about. I had a generic version of it that didn’t work too well, but people I have talked to seem to like the xaphoon. Ezio is making a good move to start sax at 52 – I’m 68 and have just started – now it is said to take 10,000 hours to get good at anything – so I’ll be pretty good at 93 if I practice for 1 hour a day- he will get there well before me – roll on !! I have heard the 10,000 hour idea as well. Have you played any music before saxophone though? That will help a lot. And you could very well be more dedicated to it than Ezio. Really though, it doesn’t matter as long as you enjoy the music. The comments above about relaxed, natural embouchures are right on target. It’s important to remember that the geometry of everyone’s ‘chops’ is different, and what works for one person may not work for another. Hi, I’m 41 and and have been learning the sax for 2 years, due to some surgery I haven’t been able to play for 6 months or so..am now getting back to it and am still yet to find a good mouth position..
Glad to hear you can play again. I would actually say you use your tongue differently depending on the type of articulation. If you want a smoother, more legato sound, you don’t use the tip as much. If you want it staccato, you would use the tip more. However, after 2 lessons and a few hours practising I can already screech out an acceptable Strangers in the nNight, Fly me to the moon, Begin the Beguine and God save the Queen. Glad your sound is coming along Tim. Keep it up! haha, it seems to me like it can be relaxed in the wrong ways or tightened in the wrong ways. Mostly I think the positioning just needs to be right and there shouldn’t be too much pressure, it will develop as you play, and after that you don’t need to worry too much about it. agreed neal,after all my years of playing what is it with the sax that is so unique to each person? I even had one fellow musician that had done studio work for some big names that can play every instrument out there tell me he gave up on sax.I guess it’s that to each his/her own. but with your site it is obvious a lot of people have access to what ever help they need. haha, I saw a similar situation with my friend in the salsa band. He can play bass, timbales, guitar, piano, congas, etc, but had a lot of trouble trying to play alto sax. I think great musicians will bring their personality though, but you have a little more control on sax it seems like. It took me many years to develop my embouchure and proper breathing for the tenor sax. The best method I found was developed by Joe Allard, a former professor at Julliard. I recommend researching Joe and purchasing the DVD. Dave Liebman also uses Joe’s method for embouchure. I studied with Joe in the 60’s. His approach to the embroucher was right on. I use his warm-ups and advice every time I pick up my horn. I have been interested lately in reading more about him. His comment about Dave Liebman was—he has my method all backwards. He also said that he had never gave DL permission to use his methods in his own book and video. I’m really enjoying your site- very informative and good attitude. I’m 64 and just beginning the alto sax.I’ m having trouble hitting the lower g note when I tongue it. I don’t have a problem if I slur down from the note a. I’m wondering if this is a normal problem for beginners or is there something basic I’m doing wrong. Thanks for any help you might provide. Thanks, glad you like Sax Station. That’s a little bit strange, usually it’s easier to hit the note after you tongue…..
Maybe closing your throat or doing something that makes you anxious and therefore causes a reaction in your body. Is it only G where this problem happens? Could be the technique of how you’re tonguing notes too. Maybe I can help more if you give me more information. What is the benefit of using a method book to learn the sax? Hey Erskine, basically it’s a systematic approach to practicing. When you have a good book it will take you through a range of things to improve your playing. Sometimes you skip/overlook things when practicing on your own. 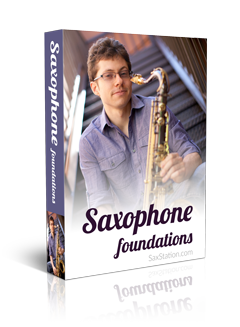 Helps build a solid foundation for playing the sax. Of course if you don’t listen or practice correctly, it won’t help that much. And it’s not the only thing you should use to practice. Hey, I’ve recenlty been trying to perfect my technique, I had someone observe me playing and they told me I had a habit of lowering my jaw and embouchure when playing lower notes, I was told that was a bad habit and would inhibit me when playing faster passages and fixing that problem would clear up my tone because I can here a bit of sub-tone when I play lower notes. Hey Chester, that’s not an entirely uncommon problem. It’s better to keep a consistent embouchure and air stream. It will give you a more stable sound, better intonation, etc. Hi, I’m just starting out at age 45, got a P.Muriat System 76. I found this website because I was looking for an answer to why I am having such difficulty playing a g (the one about 1.5-2 octaves up from the bottm – the lowest one using the octave key). I can hit it ever time by playing a two octave c scale but trying to play the note by itself is pretty tough. It seems to want to make every sound imaginable OTHER THAN a G. But I played trumpet as a kid, and I’m pretty sure trumpet is a lot tougher than sax, to get a decent tone. I’ve come to the conclusion that the answer is simply to practice, I’m sure it will “click” eventually, and become easy. My biggest problem is probably just impatience. You say it’s the lowest note using the octave key, you’re not talking about a D? Why do you assume it’s harder to get a good tone on trumpet compared to saxophone? I actually don’t play trumpet, just curious why you thought that. Probably someone who plays both could say. How long have you been playing saxophone now? Not the lowest note using the octave key, the lowest G using the octave key… anyway, I’ve only been puttering around with the sax for a couple of weeks so I sure am not qualified to say much, but I’m also trying to re-learn trumpet, and the whole embouchure/lip thing seems more grueling than on the sax. Within a couple of days I was playing a 2 octave C scale on sax, and I couldn’t do that with trumpet, despite having played it for years as a kid. A common bad habit trumpeters have for trying to hit high notes, is to play standing facing a wall, place the bell against the wall while playing, and then take two steps forward (kidding). But the nice thing about the sax is that it has a greater pitch and dynamic range possible, and more subtlety, I think, which makes it a very expressive instrument. In an expert’s hands, I mean. Certainly not in mine yet, but some day. Trumpet’s still my first love, but after hearing “Coleman Hawkins Encounters Ben Webster”, I’m hooked on sax now too. Interesting, hadn’t really thought about how it compares to playing a trumpet too much. Do love listening to some trumpet players, Miles, Freddie Hubbard, etc. Sounds like you’ll get past the issue with the G, but it will just take a little practice. Just picked up this thread as a newcomer to the site. Loved seeing the name —Joe Allard Mentioned a number of times. I studied with Joe in the 60’s. The memories of those lessons are still totally with me. His lessons on embouchure were right on. Some of these latest posts dealed with “g” oct —etc “g” is the place on the horn where the octave switch changes between the body and the neck oct hole. The horn has to be regulated perfectly so this is a smooth transition that is a horn thing and not a player thing. If you do not totally understand the mechanics of the horn you need to have it looked at by a good repairmain to make sure any problem at this point is not the horn. This can save a hugh struggle for you and let you work on you. The horn has to work properly. NEAL,I’m a disable VIETNAM VETERAN WITH A 100%P.T.S.D. AND AGENT ORANGE. I’M 61 YEARS OLD AND ON A LIMITED INCOME.I FELL IN LOVE WITH THE ALTO SAX BECAUSE OF MINDI ABAIR. I FIND THAT IT HELP ME TO DEAL WITH THE PAIN OF WAR. IT REALLY RELAXES ME.AND I LOVE THE SOUND OF PLAYING IT!! !I’M TAKING A CLASS FOR A YEAR NOW. BUT I WANT TO PLAY JAZZ REALLY BAD. I REALLY ENJOY YOUR TIP ON YOUR SITE AND HOW IT BREAK THE NOTE DOWN AND EASY.I LEARN HOW TO PLAY CARELESS WHISPER BUT NOT THE WHOLE SONG.I JUST WANT TO PLAY FOR MY HEALTH.I FIND IT HEALING TO PLAY A SONG.THANK YOU SO MUCH NEAL FOR YOUR GREAT FREE TIP.YOUR A GOOD MAN!!!!!!!!!SGT. RICK SALDE 82ND AIRBORNE INFANTRY DIV. VIETNAM 1968 TO 1969. AIRBRONE- ALL THE WAY!!!!!!!!! Glad you’re enjoying playing your alto. And thanks for saying that. When things sound easy it usually means a lot of work has been put in to get there. What approaches have you taken to work on them? What would the other number you would use? #3? #2.5? It has to do with the combination with your mouthpiece and how comfortable it feels. Now I use 2.5 with a somewhat wide tip opening on a metal mouthpiece. I have used 3’s, 3.5’s. Mostly depended on the mouthpiece. You probably don’t want to use below #2 if you’ve been playing for a little while. A reed that’s too soft isn’t great, but it’s not good to have one that’s too hard either. Working harder to get a sound won’t necessarily make you sound better.